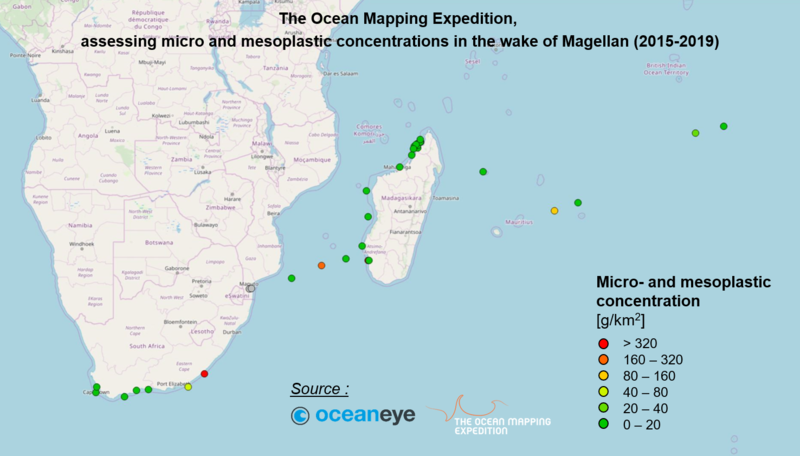 The Micromegas program on meso and microplastic pollution, in partnership with Oceaneye NGO, shows that more than 90% of the surface water samples collected by the expedition to date contain plastic particles in higher proportions than in considered « highly polluted » Mediterranean, with a record average pollution of 551 g/km2 in Southeast Asia. From Seville to Dakar, 194 surface water samples were taken by the crew. And of the 187 samples analyzed by the NGO's biologists, it turns out that 91% contain plastic polymers in the analyzed dimensions, from 1.0 to 5.0 mm for micro-plastics and over 5.0 mm for meso plastics. 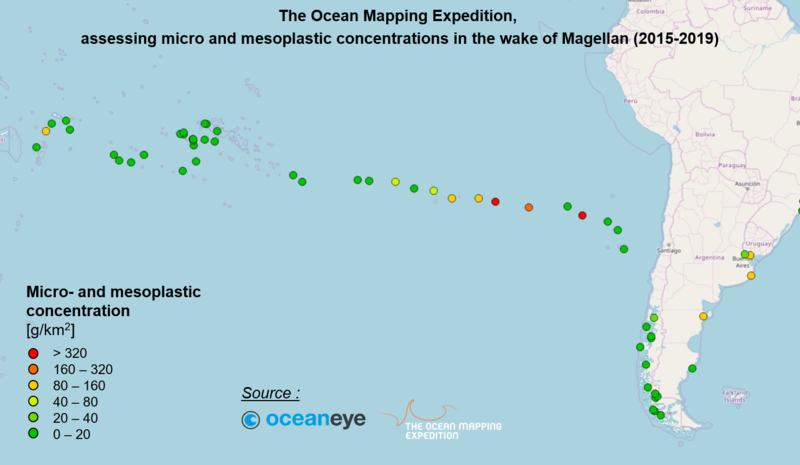 « All areas The Ocean Mapping Expedition crossed are affected by plastic pollution, » says Pascal Hagmann, executive director of Oceaneye and head of the Micromegas program. « The average pollution of all the samples collected by Fleur de Passion is 26 g/km2 in micro-plastics and 195 g / km2 in meso-plastics, ie a total average concentration of 221 g/km2 », he adds. « Southeast Asia beats all records with an average pollution of 551 g/km2 », continues Pascal Hagmann, who however notes that the very high concentration of plastic particles observed in this region of the world is linked to a few samples particularly polluted. « The most polluted sample was collected off the archipelago of Palau (Micronesia) with a pollution of 50'546 g/km2, he says, even if it should be noted that the latter figure, although impressive, is by no means indicative of average pollution in this region », crossed by the expedition end of 2017-beginning of 2018. « The Great Barrier Reef is also highly polluted with an average concentration of 855 g/km2. This figure is nevertheless to be taken with precaution because the number of samples collected by the expedition in this region from April to June 2017 is limited and one of them proved particularly polluted », tempers Pascal Hagmann. « The South Pacific Gyre, although thousands of kilometers away from any human activity, is also particularly polluted with an average concentration of plastic measured at 185 g/km2 », he continues. Chilean Patagonia and Polynesia, on the other hand, are very poorly affected areas. Indeed, these regions are far from sources of pollution (densely populated areas) and are not under the influence of waste accumulation areas. « By way of comparison, the concentration in the South Pacific Gyre or the Great Barrier Reef is close to the level of pollution observed in the western Mediterranean Sea, a region considered by the scientific community to be highly polluted », Hagmann concludes.